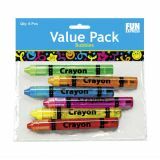 These bright Crayon Bubble Bottles include .14-oz. plastic bottles of bubbles with wands. 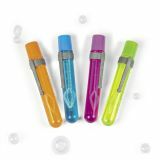 (6 pcs./PBH, 6 PBH/pack) 3 1/2"
Each plastic tube contains 4-oz. of bubbles and has a whistle on one end and a hand clapper on the other. 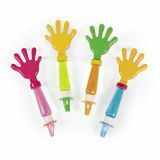 Assorted colors, 10"
Specially-formulated bubble liquid lets you hold the blown bubbles in your hands. Includes 1.25 oz. of bubbles in 4 3/4" plastic tubes with wand.